In keeping with my current efforts to more familiarize myself with the current state of Mainstream Marvel Superhero Comics, I've enlisted my comic collectin' daughter to help me out a bit. With a few exceptions (such as Captain America, Punisher, and Moon Knight), I'm just not really interested in much that Marvel has been putting out for quite a while now, as far as their superheroes go. It's not that I don't like Marvel. . .it's just that honestly I'm more of a DC guy when it comes to NEW comics. Give me some Bronze-Age Marvel, though, and I'm a happy man. My daughter, on the other hand. . .she LOVES Marvel. She's all about the crossovers, the dense soap-opera continuity and everything else that comes along with being a modern Marvel fan. Don't get me wrong. . .she absolutely adores Nightwing, Suicide Squad and the Teen Titans, but she's definitely a Marvel girl. So I've been asking her to toss a few things my direction from mainstream Marvel to check out, and so far she hasn't steered me wrong with some great X-Men (Phoenix: Endsong) and Spider-Man (Marvel Age Spider-Man Team-Up) comics that I really enjoyed. This time out, I had some guidelines for her. I asked her for something more recent (as in, no more than 2 years old), and for something that SHE liked that I would NOT. She stepped up to the challenge and pulled these comics for me. . .smugly informing me that I would regret every minute I spent reading them. If I didn't like "America" (also from her collection and the new Longbox Junk low bar everything else gets compared to), then I was definitely going to dislike this series as well. 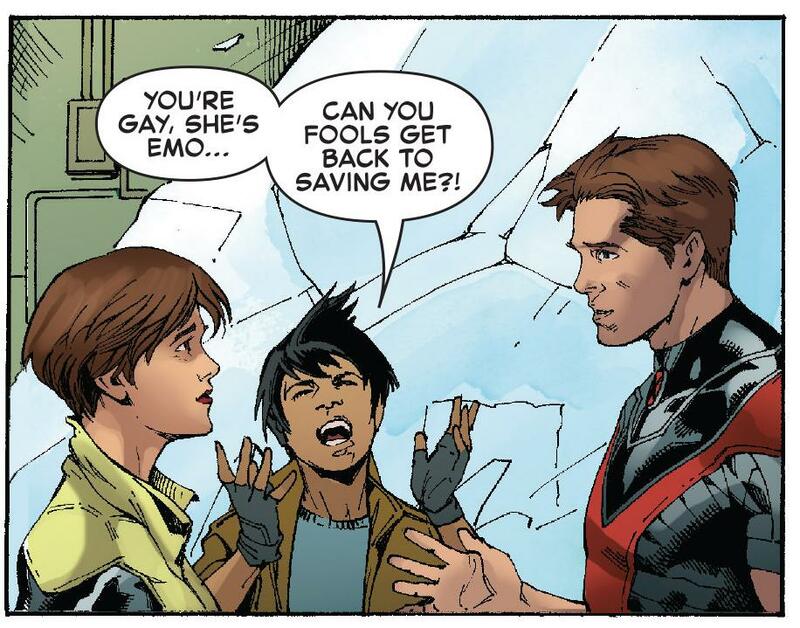 I have basic comic fan osmosis knowledge of Iceman (basically the X-Men's Johnny Storm, but with ice), and know from reading comic sites on the internet that there's been a bit of Brew-Ha-Ha about him being retconned into a gay character. So I asked my daughter what I was getting into here. In other words, just how gay IS this series? Is it gay enough that the writer creates an entire universe populated by gay characters who have babies through space magic (Again. . .America)? She told me it's not THAT gay, but it's pretty damn gay. IF YOU GRIT YOUR TEETH AT THE THOUGHT OF "SOCIAL JUSTICE" OR "FORCED DIVERSITY" IN COMICS, DO NOT READ THIS REVIEW. IF YOU GRIT YOUR TEETH AT THE THOUGHT OF A STRAIGHT WHITE GUY CRITICIZING COMICS REPRESENTING LGBTQ CHARACTERS, DO NOT READ THIS REVIEW. Okay. . .everybody in that's staying in? I don't have a problem with LGBTQ characters (or characters of other races, or combinations of both) as long as there's not an overwhelming or militant identity politics message that completely dominates the story to the point that's ALL the story is. . .so I think I can give this a fair shake. Bobby (Iceman) Drake has a lot on his plate. . .he's struggling with how to fit into the gay community, he's trying to teach a younger time-displaced version of himself how to be a hero, his father ends up in the hospital with heart problems AND he has to fight members of the hard-line anti-mutant cult "The Purifiers" as they try to kill a young mutant. As an introductory issue being read by someone only moderately familiar with Iceman, I found this to be a lot better than I expected (especially given the controversy over this series). Bobby Drake as a character trying to find his place in life as he gets older is pretty well explained without a lot of obvious exposition. His powers are nicely displayed in a short action scene, and his relationship with his disapproving (of him being a superhero, they don't know he's gay yet) parents is also well sketched out as he visits his father in the hospital (they just want a normal son and maybe some grandkids). The art is a lot darker and grittier than I expected for something that features a youthful, "quippy" (is that a word?) character like Iceman. 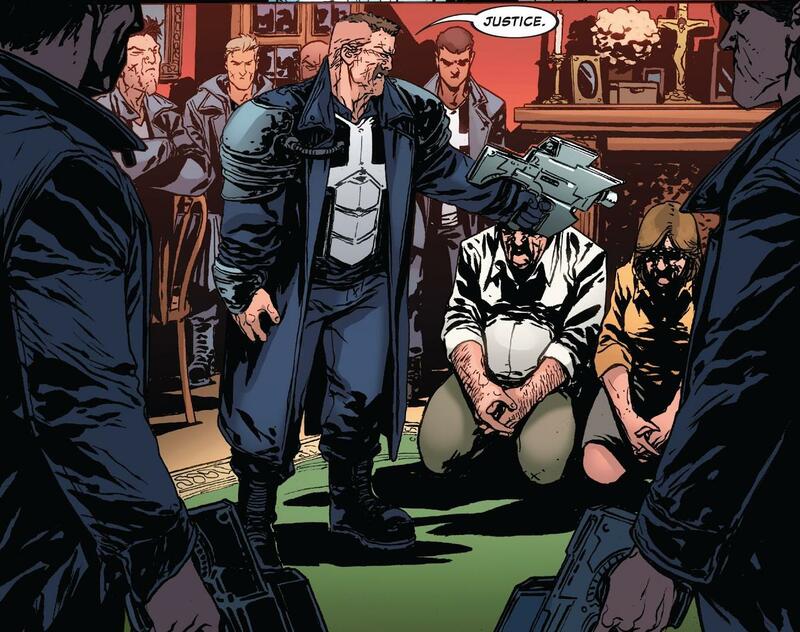 The art is something I'd expect to find in Punisher or maybe a more grounded Captain America or Daredevil story. That's not to say it's bad at all. . .I like that gritty style a lot. It just seems like an odd choice for a comic obviously aimed at a younger audience. Overall, we have a good introduction of the main character backed up by some unexpectedly gritty (but good) art. To address the pink elephant in the room. . .yes, it's pretty gay. Fortunately (and unlike America) there's more meat on the bone here than just "LOOK! GAY!". There's an actual story here beyond identity politics, and surprisingly it's a story I want to read more of. That said. . .if you grind your teeth at ANY identity politics in comics, then be warned that Iceman's new sexual identity IS a major part of the story here. It's not ALL the story, but this comic doesn't shy away from the gayness at all. Now I'm wondering if my daughter MIGHT have been gaslighting me a little bit by telling me how much I was going to dislike this comic. . .because I liked this first issue. Is it the best comic story I've ever read? Not even close. . .but it's really not bad either. 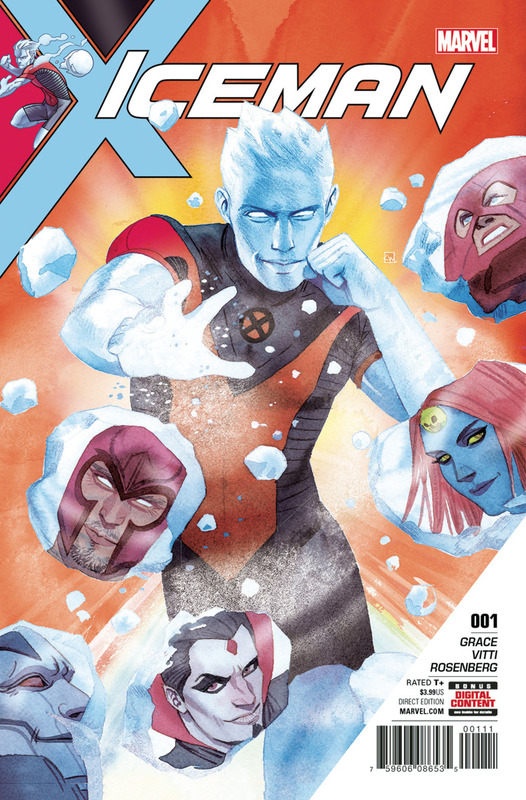 Iceman is teamed up with his former girlfriend, Kitty Pryde, on a mission to retrieve a young mutant whose uncontrollable powers affecting electronics have put his life in danger from an angry mob. During their time together, Bobby and Kitty come to terms with Iceman's new status quo. 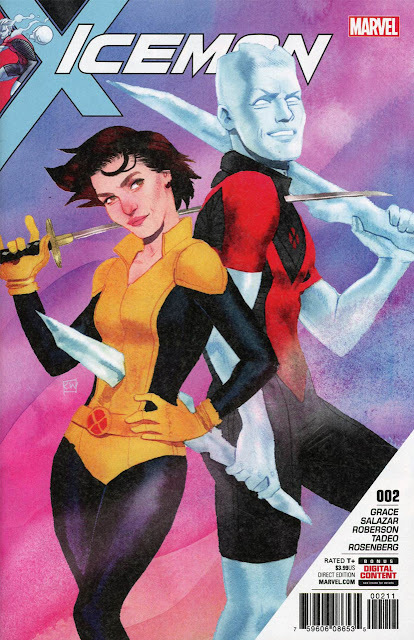 I've read comments on other reviews of this series (and there's a LOT of comments on this series out there) that the relationship between Kitty Pryde and Iceman has been retconned into something a lot more than it actually was, but I'm not sure that makes much of a difference for those (like me) not familiar with the convoluted storylines of The X-Men. Continuity retcons aside, even though I found the conversations to be wordy, the dialogue comes off as readable and pretty natural. There's an art team changeup in this issue as well. The SECOND ISSUE. I've never seen an early art switch bode well for the success of a comic (and the meager 11 issue run here seems to bear that out), but that said. . .the art is actually more along the line of what I would expect from this series. The lines are crisp, it's less heavily inked, and the facial expressions are more detailed than the dark, gritty art style seen in the first issue. Overall, the second issue focuses more on Bobby Drake as a gay man coming out to his friends than on Iceman as a superhero X-Man. It's not a bad story and I still want to see where it's going, but hopefully the writer can balance things out a little more like they were in the first issue. Bobby Drake visits his parents for dinner, determined to come out as gay to them, but as he struggles with their already-massive disapproval of his superhero lifestyle a purifier hit squad attacks, seeking revenge for Iceman's thwarting their attack on the hospital (first issue). 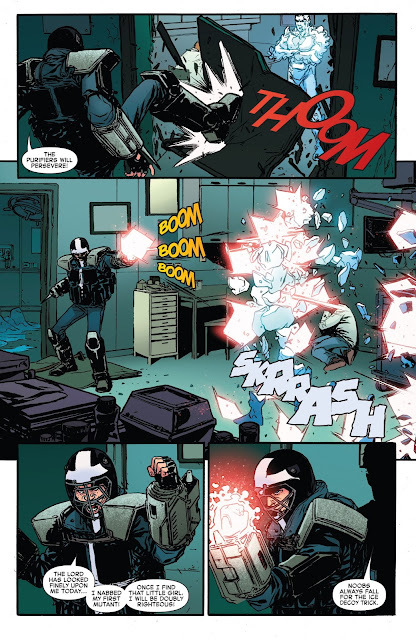 After a brutal battle, Iceman defeats the purifiers and saves his parents, but after seeing his powers on full display, they are more frightened of their son than anything. This third issue leans even more heavily into Iceman trying to find ways to tell those he loves that he's gay than the second did. . .which sort of makes me wary of the future direction of this series after the high hopes of a balanced gay superhero story I had with the first issue. That said, the writer has an ear for dialogue and the extremely awkward dinner with Drake's parents where snide remarks and petty comments on Bobby being a mutant and living a wild superhero lifestyle instead of just getting a regular job and trying to be "normal" is just as uncomfortable to read as I imagine it would be to actually sit through. The Purifier attack just seems tacked on and the dialogue during the fight seems more forced and unnatural than the tense, understated battle of quiet words and sideways glances that took place beforehand at the dinner table. The issue probably would have been better without it, but then again showing Iceman's parents as being afraid of their own son after the fight even though he just saved their lives is a pretty interesting angle. This issue also switches back to the original artist and his dark, gritty style. . .but in this issue the art looks a bit rushed and even sloppy in places. . .especially when it comes to faces. I see that the first three issues of this series came out over 2 months before settling into a monthly schedule, so hopefully the art will even out as it goes along. Overall, this third issue slumps a bit. Despite a nicely tense and uncomfortable dinner scene, the rest of it sort of falls into an unnecessary combat sequence, giving this comic a somewhat schizophrenic feel. The art also seems rushed and sloppy in places this time around. I had some fairly decent hopes for this series based on the first issue. Hopefully this issue doesn't signal the start of a quick downward spiral. When a student goes missing (Zach, the young mutant Iceman and Kitty Pryde rescued in issue 2) Iceman follows the trail to a posh nightclub and a confrontation with Wolverine's son, Daken, that goes from tense to violent after Zach declares that Dakin is his new master and he's leaving for Madripoor to become his student. 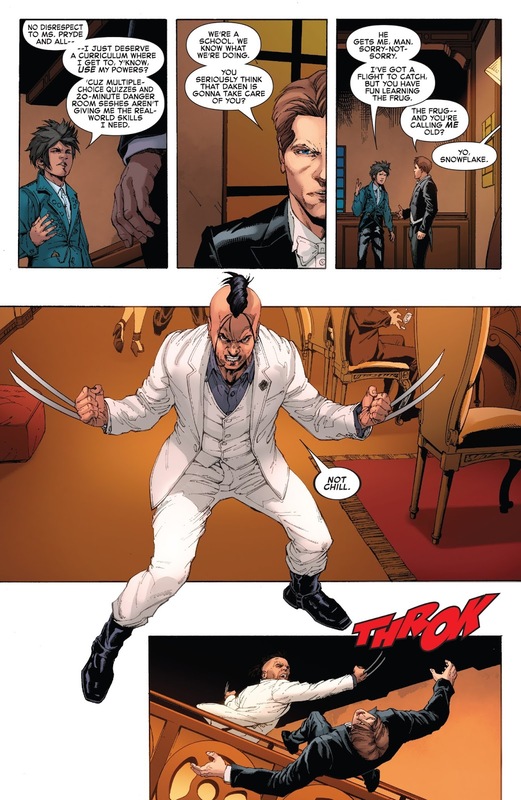 Iceman defeats Daken, but not before Zach escapes. In the aftermath of the battle, Iceman realizes that his focus on himself and his own personal issues is keeping him from being the teacher, mentor, and leader that he needs to be. . . 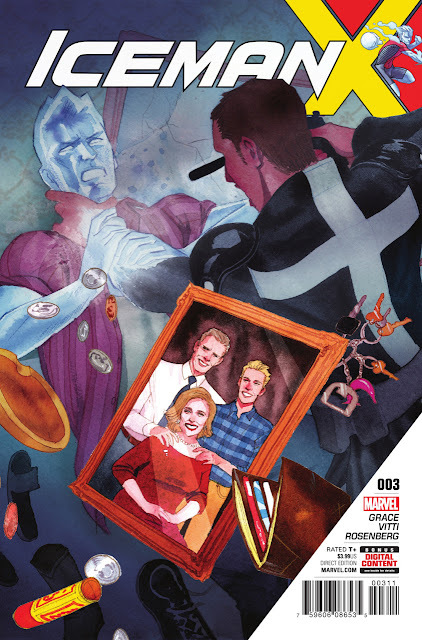 In this issue, Iceman's realizing that his personal issues are holding him back seem to be reflected in the writer shifting the story away from an almost total focus on Iceman's struggle with coming out and back toward a more balanced story. Yeah. . .there's still gayness to be found in this issue, but the story revolves more around how Bobby has lost his focus because of it. 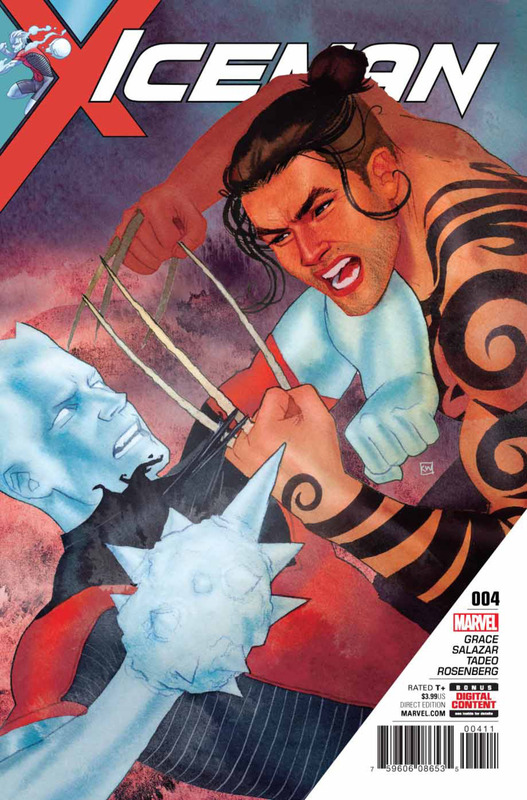 There's quite a bit more action in this issue, with some great fight scenes between Iceman and Daken that are a welcome change from the tacked-on feel of the action scenes in the previous two issues. There's also ANOTHER art change in this issue, swerving back away from the dark and gritty art to a more mainstream comic style. It's still a little rough in spots, and the artist can't seem to decide if Daken has two metal claws or three bone claws, but the art has a nice, cinematic style and panel layout that matches the more action-oriented nature of this issue nicely. Overall, this issue is a welcome swerve back to a more balanced story with some great action scenes backed up by some nice, cinematic comic art. Based on the writer's course correction here, my hopes for this series are somewhat renewed. After finally coming out as gay to his parents, Bobby weathers their extreme disapproval, but the tense confrontation is interrupted when Juggernaut attacks. During the battle, Iceman's father reads a letter that Bobby never sent, and after Juggernaut is defeated, he finally accepts his son for what he is. This final issue of the first Iceman arc follows an established pattern that (looking forward into issues to come) took a couple of issues to set up, but looks like it's here to stay. . .that of the story being half "I'm gay" and half "I'm a superhero". Luckily it's much better-balanced than America's "THE WHOLE UNIVERSE IS GAY!" setup and it hasn't gotten tiresome just yet. 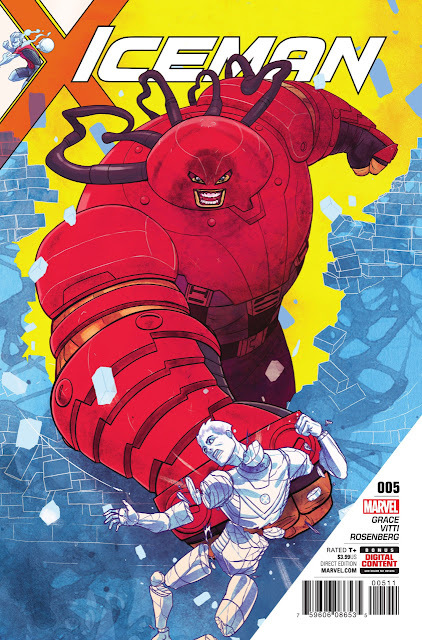 Iceman's finally coming out to his parents and the following confrontation is extremely tense and emotional, while the battle between Iceman and Juggernaut is a real action-packed showstopper. The artist really steps up this time out and gives us some of the best scenes in the series yet. His version of Juggernaut is one of the best I've seen! 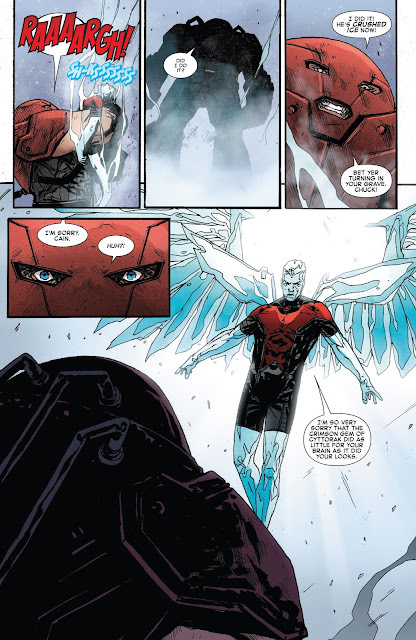 One thing I DON'T like is Iceman's "Angel Wings". Sure, they look great, I'll give it that. . . but as far as I know, Iceman has always "flown" by skating along on an ice ramp. It's sort of Iceman's signature move, I believe. With the wings, he just doesn't look right. I think the artist realized this as well, because the wings don't show up again. Overall, this final issue of the first Iceman arc brings everything to a very nice close, with a story that swings from tense, combative dialogue as Iceman struggles against his parent's disapproval to some great superhero battle action, and then back to a very nice, quiet emotional finish as Iceman and his father reconcile and accept each other for who they are. It's a good ending. Let's get a bit personal here. I have a stepson who is gay. Actually, I consider him my son. He was 6 when I married his mother 20 years ago and his real father hasn't shown up since, so I think I can claim the title of "Dad" at this point. When he came out as gay to his mother and I a few years back, he was a little confused as to why we were so goddamn happy. He'd been agonizing over it for years and hearing stories of confrontation and worse from Facebook groups and friends of his. He was ready for a big dramatic scene and instead he got hugs. We were happy because WE had known he was gay since he was 12 years old. We were always wondering when HE would finally figure it out. So what he was dreading would turn into a confrontation, actually turned into a bit of a celebration. He's married to a great guy now and he's happier than I've ever seen him. The point of this is that as I read this series, it made me remember that not everybody has as good an experience as my son when they realize the truth about themselves and decide to tell the ones they love. It's actually a pretty powerful center to this series for a reader who can relate a bit. Unfortunately, not everyone who reads this series will have that sort of emotional connection. Instead of seeing a pretty good story about a man trying to figure out his place in the world and how to tell others about his choices, they're going to see a classic character ruined by a "forced diversity" retcon. But let's set aside my emotional feels about the heart of this story and take an honest look at the nuts and bolts of it. . .
What we have here is a pretty good story. It's not a great story. But then again, it's not nearly as bad as you would think reading comments about it on comic sites. There's a LOT of hate for this series that I feel is not deserved. Like I said, it's not the kind of story that's going to make any "Top Fifty Marvel Stories of All Time" lists. But it's really not bad, either. I give it a solid 3 out of 5 stars. It handles the story of a gay superhero a LOT better than America did. Where America was packed to the brim with cringeworthy extremism, militant racism and political ideology, there really is none of that in Iceman. I went back and re-read these 5 issues and there isn't ANY political rhetoric to be found. Yes. . .Iceman being gay IS the framework that the whole series is built on, but it's not presented in a political, ideological, or extreme way. It's just. . .the story. This series was better than I expected it to be. Again. . .it's not great, but I enjoyed reading it. Aside from Iceman's personal problems, there's also some good superhero action scenes to be found. I strongly suspect that my daughter was gaslighting me when she played this up as something I would hate. If she wasn't gaslighting, then she underestimated my ability to give things a fair chance. All in all, this series (so far) is a pretty good character study of a gay superhero trying to adjust to a new status quo. If that sentence didn't make you grit your teeth, give it a read if you spot it in the bargain bin. The back half of Iceman. Issues 6 - 11. Can they keep this thing in the "pretty good" lane it's cruising in? Will it get better? Will it go flying off the rails? I really appreciate your thoughtful reviews and, as in this case, personal stories that have relevance to the comics. I've never been much of an Iceman fan, but I love that you drew the parallel of him and Johnny Storm. It makes perfect sense, yet it never crossed my mind. I always tell people that there are comic books out there for everyone, and this is another example. Thanks for bringing all sorts of interesting storylines to us through your awesome blog, Longbox Junk!